Thanks for the review will. Interesting reading. Great test, makes me want to get the new green YZXStudio meter with bluetooth. What software did you use to read out the raw data over bluetooth? Blueterm 2 then just Excel to plot the graph. Good review, I like the looks of the meters so I just ordered 2 with Bluetooth. Thanks for sharing! I thought ZY1270 is the newest one. 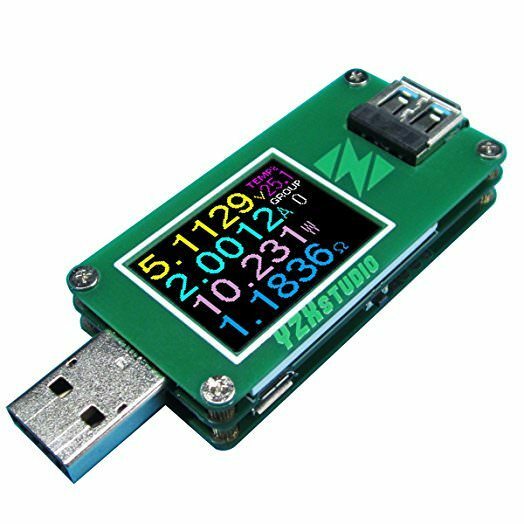 From what I understand, compared to ZY1266, it has output coding selection and a colour LCD. 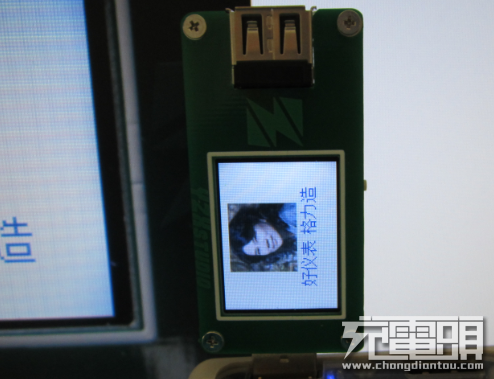 I cannot read the Chinese, but the ability to show usb coding has been present in the last couple of models. Color and USB3 is new. 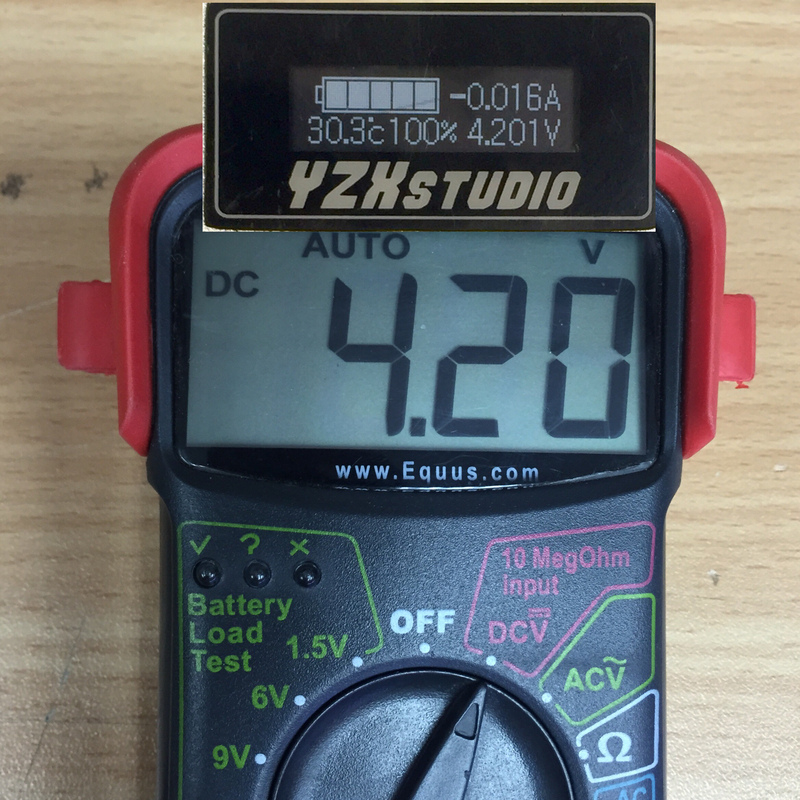 HKJ, I believe it is not only showing charger coding (which is also there) but the meter can enforce output coding – you can use a dumb charger but use ZY1270 (or ZY1230) to make it QC2.0, Apple…etc. It is definitely possible to code it into the meter. But there would not be much idea in signalling QC2.0, only Apple 2.1A/Apple 2.4A/Samsung/DCP. I will wait for a more readable manual. I do also wonder if the colors are real or just colored areas on the display. I have spoken with Franky (probably the main overseas distributor for yzx products) and he tells me the Y1270 color oled version is still in its very first FW versions, and that it’s best to wait for a couple upgrades to have bugs sorted out and get a more accurate calibration. 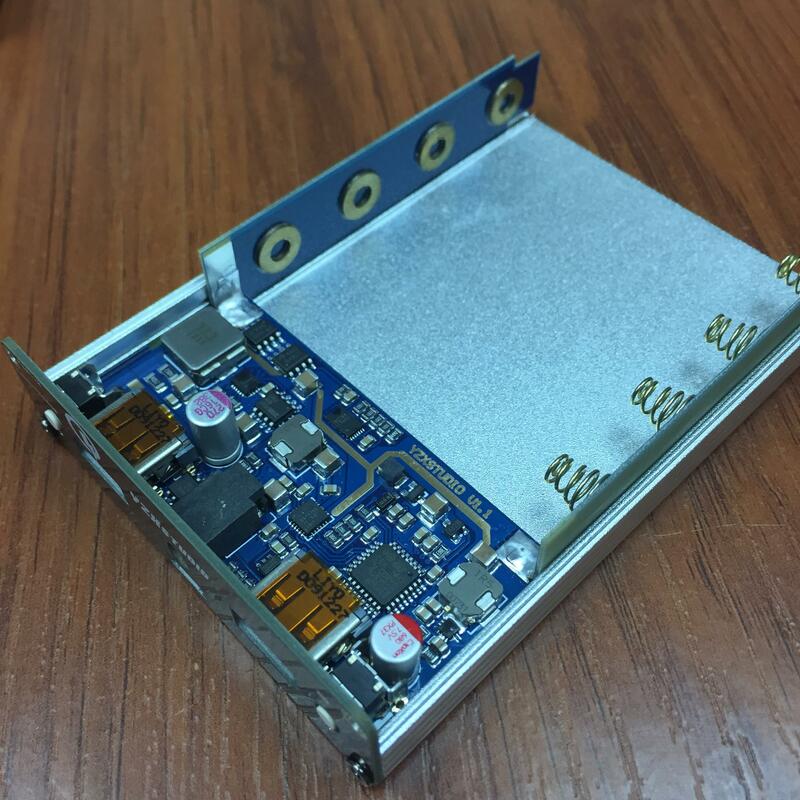 Anyways I think one could upgrade it at home with an ST usb programmer, the new FW archives are posted on chongdiantou chinese forum. 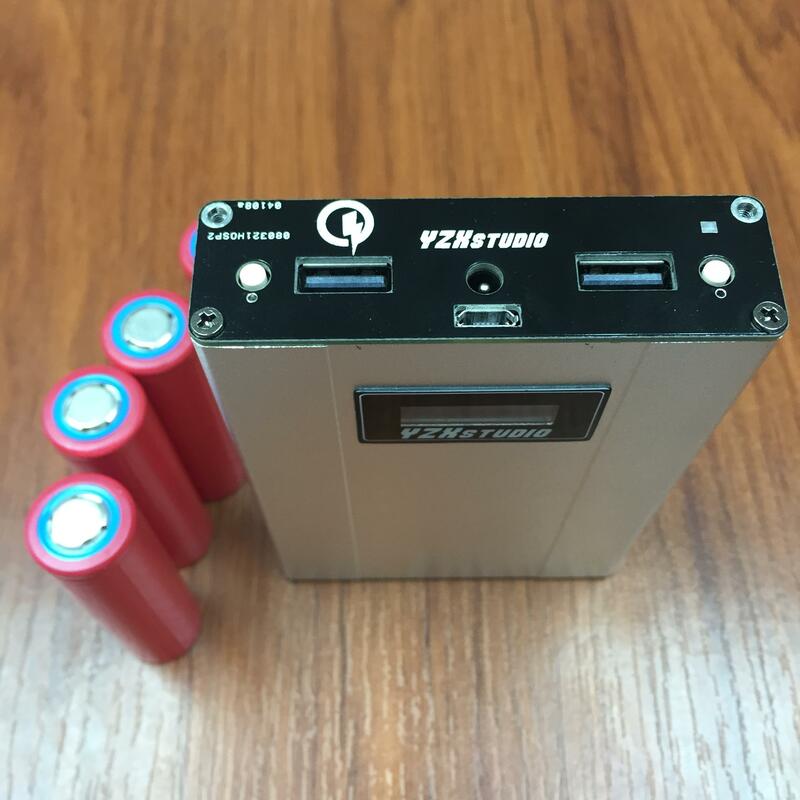 I also ordered some interesting yzx products that I will review once they arrive, a YZX 7th gen 4-cell powerbank, the fan-cooled usb dummy load and the new Y1266 meter. 99centHobbies ebay store seems quite expensive , YZXstudio stuff is double the price compared to taobao and prices discussed in the chinese forum. I’ll be totally in for a YZXstudio group buy. To buy from taobao you can use mistertao agent, but the only time I used it the item took 3 months to arrive, and they don’t accept paypal. I can totally vouch for Frankie and the 99centHobbies store. The YZXStudio products arrived in 12 days and he has replied to all of my email questions within a couple of minutes. Looking forward for those reviews! There is however nothing “budget” about YZXstudio products! I just got my ZY1270 from YZXstudio’s Taobao shop. It is neat and everything but the most interesting thing was that it was shipped by Franky Tong! I get it – the reason why Taobao is in Chinese is that they don’t want to deal with export hassles. They rather have resellers on Ebay do it. 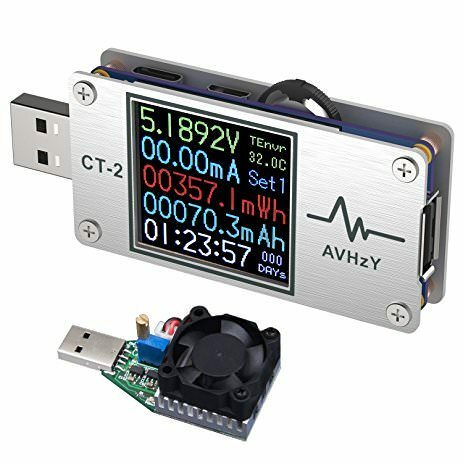 Hi everyone, since there’s an ongoing talk about the newer versions of the USB power meter and other YZXstudio gadgets I decided to turn this thread into a general discussion about YZXstudio devices. I have removed my powerbank tests which were not very relevant to the usb meter and will start a separate thread for all my existing and upcoming reviews. So this is will be more or less an “Official” YZXstudio thread for BLF if you’re ok with it, since the users for these devices are limited I thought it is best to keep all the information and talking in one place. I will add an index to the OP pointing to reviews/first impressions/new products in and out of this thread, and since this is not my personal review thread anymore, please feel free to ask or add anything related to this. 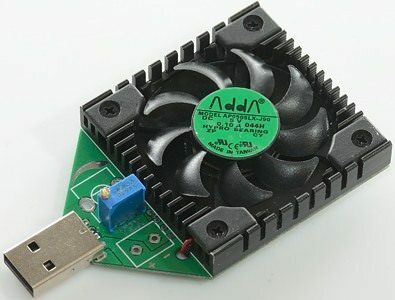 I think it’s a great idea, I have my eye on these, but was worried about the risk of buying it from eBay. Reading the above discussion makes me much more comfortable. I have a cheapo version on the way from BangGood, if I wind up using it a lot maybe I will upgrade to the xyzstudio version. -Set discharge cutoff voltage, charge termination voltage and current. I’m still trying to figure out some of the calibration features (the UI is in Chinese only), but so far I have correctly calibrated battery capacity and battery full voltage. 1× 5V & 1× 9V USB out, microUSB and 4mm input (shares the same plug as the sony PSP). 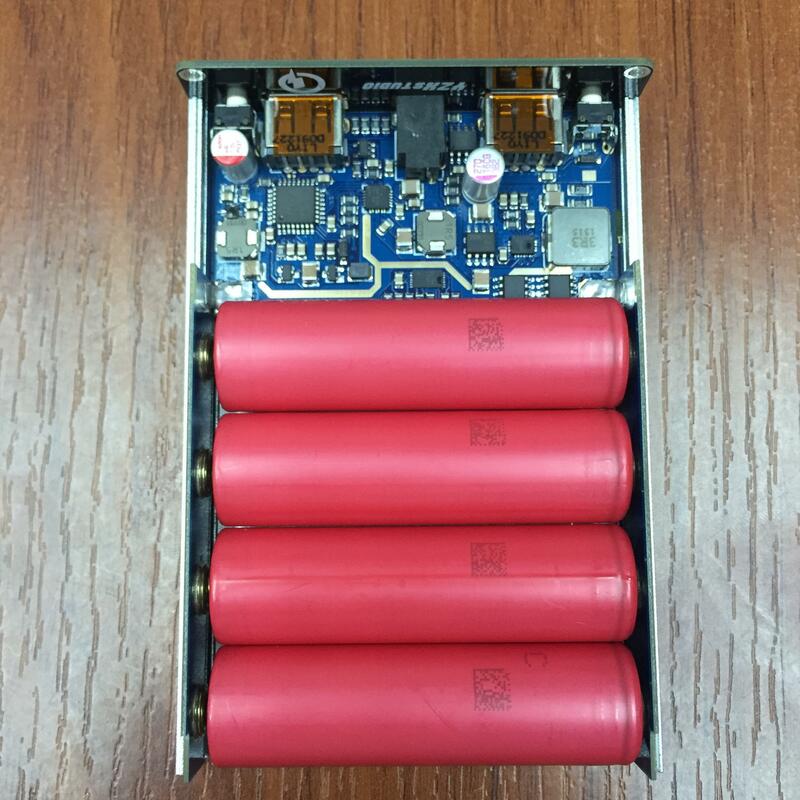 Close-up of the board, some of the components are never seen in any powerbank before. 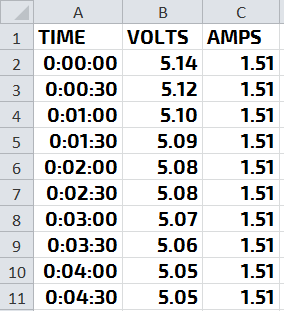 I haven’t done all of the output testings but I did a quick discharge test at 1.5A and got 94.2% efficiency. 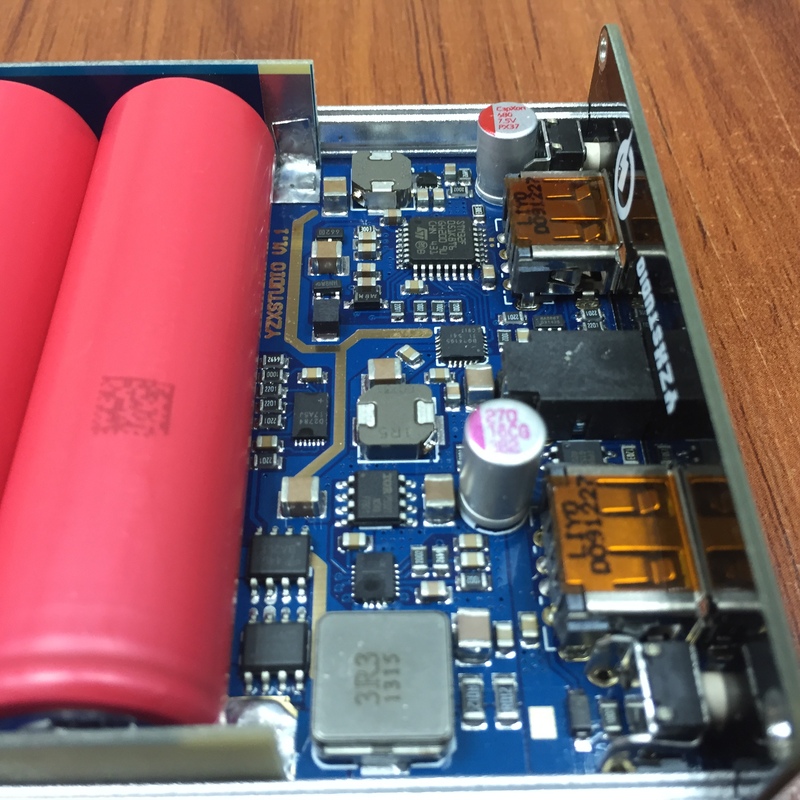 This is the highest effieicncy I’ve seen not only in a powerbank, but in ANY DC-DC boost converter. 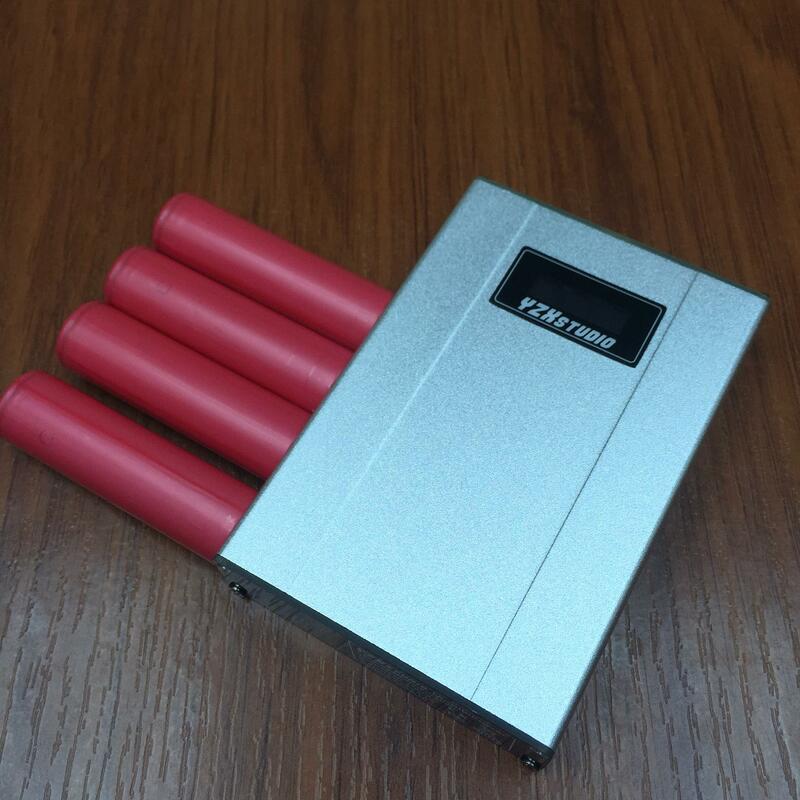 Battery capacity as measured by MC3000 at 0.5A discharge rate, with D-reduce of 250mA down to 2.5V: 3380mAh, 4 of them makes 50.02Wh. Note that the sanyo GA does not reach the spec’d 3,500mAh in real discharge tests. So far I’m amazed by the performance of this powerbank… to be honest this is one of the finest electronic device I have ever used. Will soon upload more discharge tests. Haha – I was thinking before that this is probably the most awesome power bank ever made. It looks beautiful too. And expensive, I presume? They will soon release gen8, which could have english menus but the cells are soldered because it supports ***drum roll*** 12A charging! I will order one as soon as it is available. BTW – if you have trouble deciphering Chinese you can use Google Translate on your smartphone with camera image as your input! At $60 and $25 for batteries it is not remotely budget, but it’s worth every cent! I’m after Gen 8 as well, I like that a specialized DC adapter can be used to charge even faster than Quickcharge 2.0 or 3.0. The fastest charger I have for mine now is a 9V 2.5A car adapter for 22W+ output, even faster than a quickcharge adapter at 9V 1.8A. Both can allow the powerbank to push 4A to the batteries. I’m using the google translate app, but some settings are translated as “Setting reference full power voltage”, so I really don’t know what that’s for. I also got the ZL1000 dummy load with the upgraded Bourns multi-turn trimpot, so far it works as expected and runs relatively cool. Supports QC2.0/3.0 with auto coding request. Will upload a review after some more extensive use. 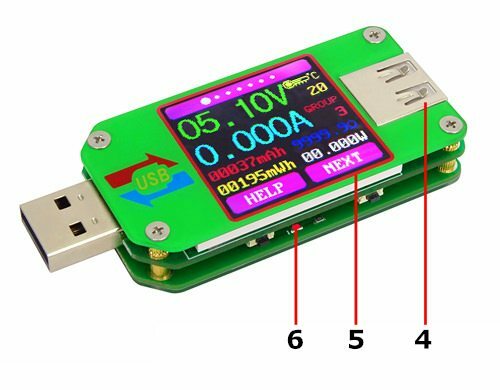 I got the YZXstudio 1270 Color OLED meter with Bluetooth a couple days ago and have been playing with it a bit… Since all the technical aspects have already been covered in HKJ’s review I decided to write a quick guide for importing the raw data from the bluetooth terminal and use them to make a graph in excel. Enter the settings menu in the meter and set the serial upload rate to anything but zero. My preferred interval is 30sec. Search and connect the meter to your smartphone, will be listed as SPP-CA. Download and run Blueterm app, long press the screen to select the device and start logging. Once done with logging the data, copy the file to your computer and rename the format to *.txt. 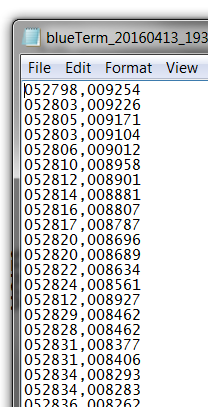 After that you’ll get two lines of data displayed in ten thousandth, so divide by that and set the decimal places you like. Add time axis as well. Final step is to create the graph of your liking and you’re done! Note that I placed the AMP value in a secondary axis. 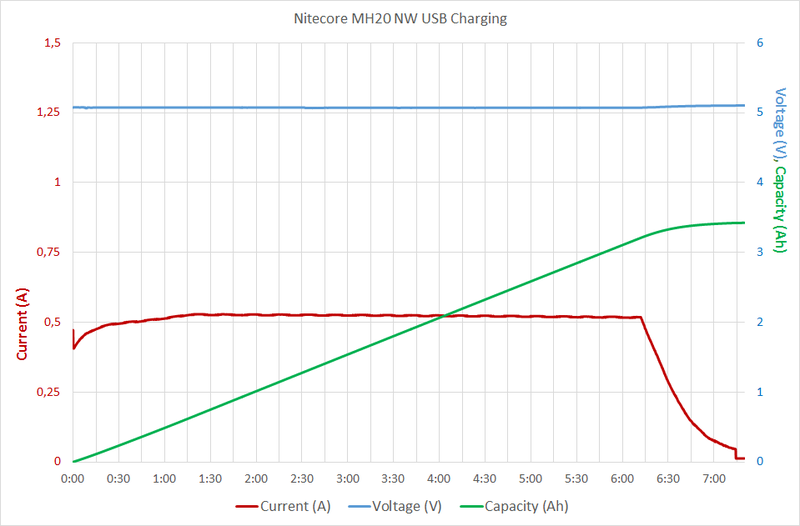 In this graph you can see how this powerbank fails to deliver a healthy voltage half the discharge cycle at a 1.5A rate, dropping from 5V to <4.3 is unacceptable. The meter doesn’t send other important parameters such as capacity and energy, but you can calculate them using simple formulas. Here’s another example, rate set at 10sec this time. 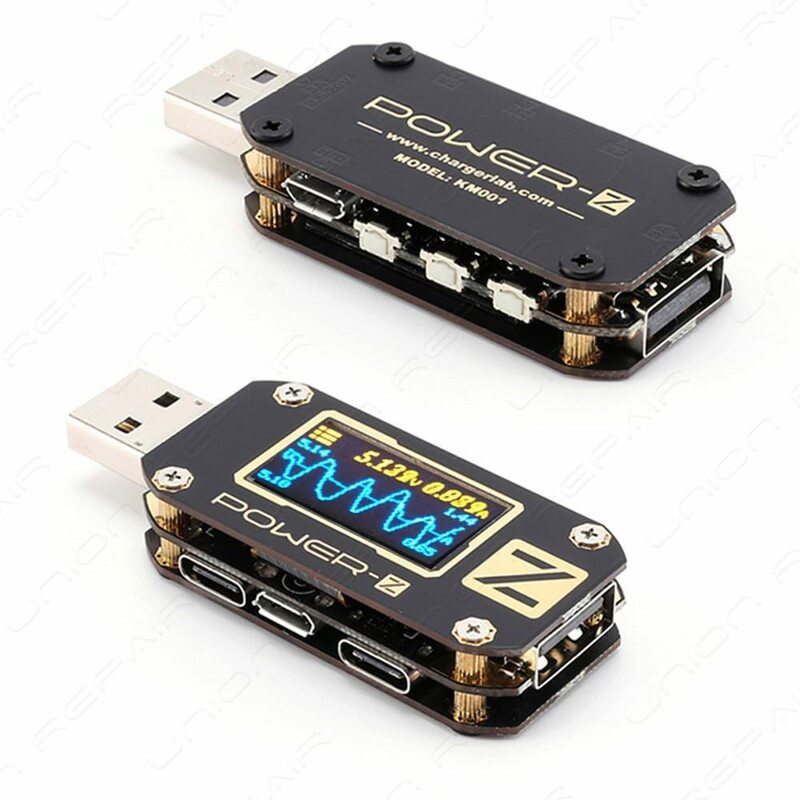 wicked the amount of sellers listing this as usb3.0 and precirurius how an typo (that seems to originate from its version3.0 get evolved to USB3.0 and then just gets a life of it self, and is more the case then none ‘ the amount of sellers listing it as usb3.0, ewen thow its clearly not one of ZXYstudios USB3.0 meters. the Bluetooth-datalogging in raw format of the 2 values, are there aint any apps that on the fly put them into an graph or manage them in a more pleasing way for the beholder.. I tryed the OWON app for there BT DMM and ewen thow there older BT2.0 APP reconize the SPP_CA (in regards to aint, on the owon bt4.0 app) it clearly wouldnt manage the values. For Energy is the same, instead of current use power. Once you have the chart done just simply import new data for whatever you’re going to test. 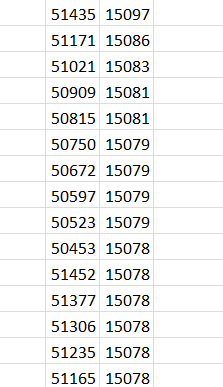 There is a very small variation in this calculated value vs the measured value displayed in the meter, but even at 10s refresh rate the variation was only at <1%. At 0.36s refresh rate the tolerance should be near zero, but that’s a lot of values to work with.